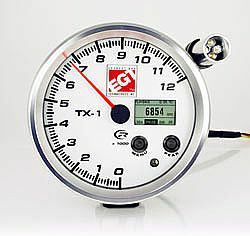 Designed especially for Sleds and ATV’s, this rugged built Tachometer is ready for this seasons aggressive runs. The TX-1 Records and Re-Plays the run for clearer, precise information. The Re-play offers selectable playback speed, Pause and rewind features, Cool Blue backlighting. A/C & DC operation make the TX-1 the perfect Tach. Other instrument brands have abandoned the Sled and ATV markets, but not EGT. Call us today and place your order for the HOTTEST TACH this season!